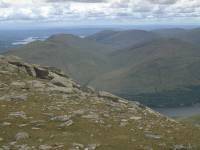 On Saturday 27th May 2000, the day after I completed the West Highland Way by walking the Rowardennan to Ardleish section, I decided to attempt my tenth Munro (Scottish mountain over 3000ft). 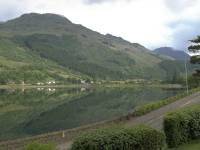 The one I chose was Beinn Narnain, which overlooks the village of Arrochar where I was staying. 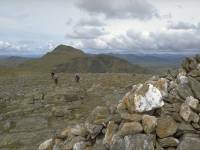 It's listed as the 259th highest mountain in Scotland, and stands 3038ft above sea level. 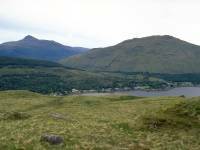 The direct approach from Arrochar is arduous and I've decided to tackle Narnain from the rear. Photographic note: the weather on this day was bright, and a very thin sun was always visible through a hazy cloud layer, but the pictures suggest a dull day. I'm not over-enthusiastic about the results and I reckon the images are only just worth showing. 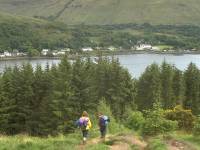 The ascent begins at the head of Loch Long and ascends through a section of forest, then heads directly up the bed of an old tramway apparently constructed for a waterworks project in the nineteenth century. At the 300 metre contour the tramway meets a level vehicle track which is followed to the left. 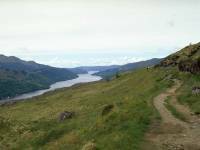 This is the view from that track, overlooking Loch Long. The track curves right to enter Coire a Balachain, between Narnain and Ben Arthur. The view to the rear is already extensive. 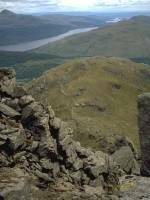 Arrochar appears far below on the opposite shore of Loch Long. 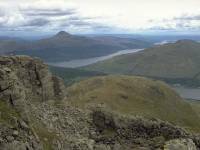 Ben Reoch stands behind the Tarbet glen to the right, while Ben Lomond's characteristic topknott rises to the left behind loch Lomond (unseen). 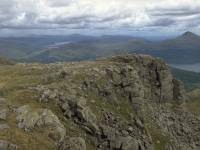 Ben Arthur, otherwise known as the Cobbler, stands on the opposite side of the corrie. 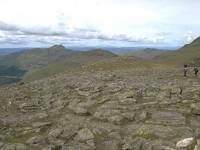 Although it is not high enough to be a Munro it is one of the most celebrated peaks in Scotland. 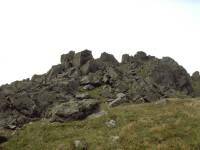 Its summit crags are a hard scramble and cannot be scaled by the ordinary walker. 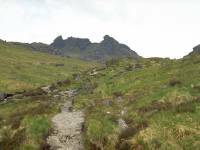 The main Coire a Bhalachain path is heading for Ben Arthur and it's a sloppy and rather indistinct route that heads past the Narnain boulders up to the col between Narnain and Arthur. 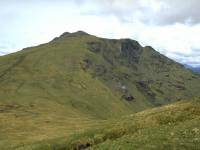 Beinn Ime, seen here, rises northwest of the col and looks as though it could be ascended without difficulty. 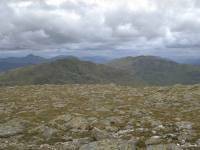 The route curves around towards the Bealach a Mhaim between Ime and Narnain over wet ground, but well before the actual col a path is found ascending the rear flank of Beinn Narnain just south of east. 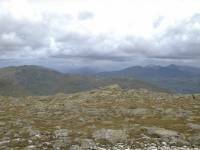 Still looking back at Beinn Ime as I ascend Narnain. 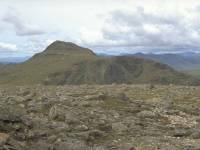 Ben Vane (properly, Beinn Mheadhoin) can be seen to the right. This shot is looking almost due north. No mountain ascent is ever completely straightforward. The path ascends fairly easily to a shelf but then peters out. To the left is a sloping boulder field that must be tackled to attain the summit dome. 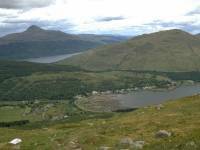 The view back to Beinn Ime. The boulder field isn't actually too awkward and soon gives way to turf again. 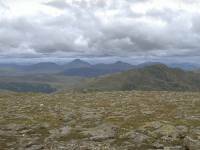 The best views are still to the north, with the bulk of the central Highlands now in view to the right of Beinn Ime. Sadly, I couldn't put a name to any one of those peaks. 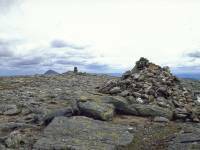 Suddenly the gradient levels out and the summit cairn is seen not far ahead. 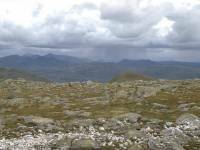 The summit of Beinn Narnain, 626 meters or 3038ft above sea level. 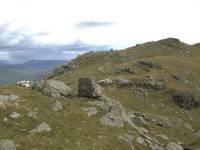 The Ordnance Survey trig pillar is seen a hundred yards to the east, with Ben Lomond's summit dome poking up to the left. 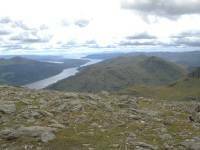 The view from the summit down the length of Loch Long. 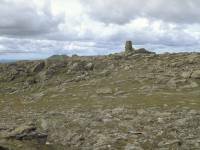 Summit panorama 1. 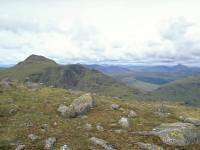 The view to the north northwest, with Beinn Ime to the left and the central Highlands to the right. Summit panorama 2. Looking northwest. Summit panorama 3. Looking west. Summit panorama 4. 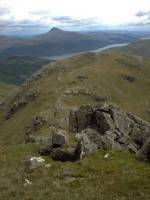 Looking southwest to Ben Arthur. Summit panorama 5. Just west of south, with Loch Long dominating the view. Continuing the panorama from the north northwest. Beinn Ime again. Summit panorama 8. Just about due north here. 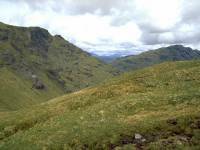 Ben Vane is to the right. 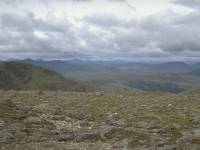 The prominent peaks in centre shot are most likely the Ben Lui group south of Tyndrum. Summit panorama 10. Northeast into Glen Falloch, at the north end of Loch Lomond. A shower can be seen in the glen. 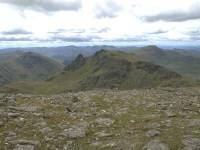 The Falloch Munros (including An Caisteal and Cruach Ardrain) form a compact group to the right, while the twin summits at the back are very probably Ben More and Stobinian. Summit panorama 11, looking east northeast. The Glen Falloch hills are to the left, with the rather lonely north Trossachs hills to the right. Summit panorama 12. Just east of south, looking down at Loch Long. 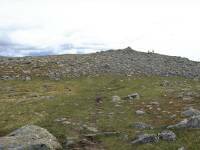 Summit panorama 13, to the southeast. Loch Long is to the right. 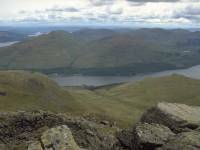 The southern end of Loch Lomond peeps over the top of Ben Rioch and Beinn Bhreac. Summit panorama 14. 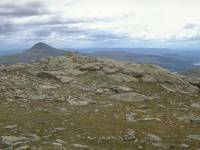 East southeast aspect, looking across Narnain's east top towards Ben Lomond. I was now debating a descent route. Go back the way I came or have a look at the direct (southeast) face of the hill? 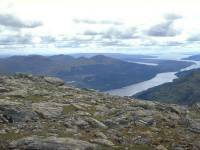 Loch Long seen from the col between Narnain's main summit and east top. I've arrived at the rather fearsome looking crags at the southwestern edge of Narnain's summit dome. The biggest one is called the Spearhead. The path goes straight down into that gully in front, and I could see its continuation across the lower ridge about half a mile away. Still dubious. The Spearhead. I was just making sure of my position here. The gully was nasty enough to make me think twice. ...but this is the obvious descent route, no matter how fearsome it looks. I decided to try my luck and go as far as I thought prudent. Six-point contact was necessary (for those unfamiliar with hillwalking, that basically means sliding down on your bum). 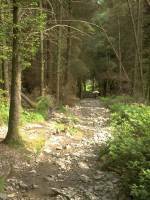 The gully is what the guidebooks call "interesting" or "challenging". It's a bit of a scramble and there is no dignified way up or down. The descent heads straight down between the crags. The gully from below, looking straight up at the Spearhead. It's steeper than it looks in the photo. A short respite as the path heads out across this shoulder. To get here was tricky - the path appears to head over to the southwest and it appears that it's going to drop straight into the Coire a Bhalachain. Just before the lip of the slope it twists back again to duck under an overhanging rock and you have to climb through the gap at an angle of forty five degrees. Looking back at the Spearhead again from the same point. 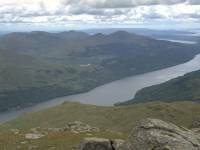 Arrochar comes fully into view for the first time at about 1800ft. 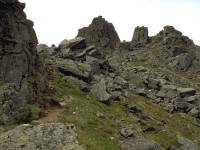 The path has dropped down several steep sections and each of them has its tricky moments; rock outcrops, waterslides, miniature crags. Each obstacle is a mild scramble and requires care. the net effect is tiring. I'm glad I wasn't coming up this way. Difficult to the last, the path drops across another awkward rocky bit to reach the old waterworks track - then descends the concrete blocks of the old tramway bed. Awkward to climb, they are murder coming down and every step jars the knee and ankle joints. The final couple of hundred feet through the forest. Even this far down, every step is a potential accident and it would be all to easy to sprain an ankle. Made it at last! Back in Arrochar for a nice pot of tea. That's A Chrois in view, a Corbett just northeast of Narnain. 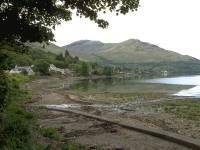 A last view of Arrochar. 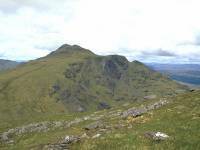 I had a climb of Ben Lomond in mind for the Sunday but I found myself developing a nasty sore throat on the way down from Narnain. By Sunday morning it had developed into a cold, I felt like sh*t, and decided to abort the trip and come home a day early. 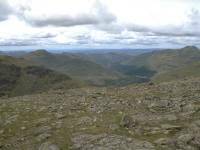 A great pity, but at least I could claim a tenth Munro.